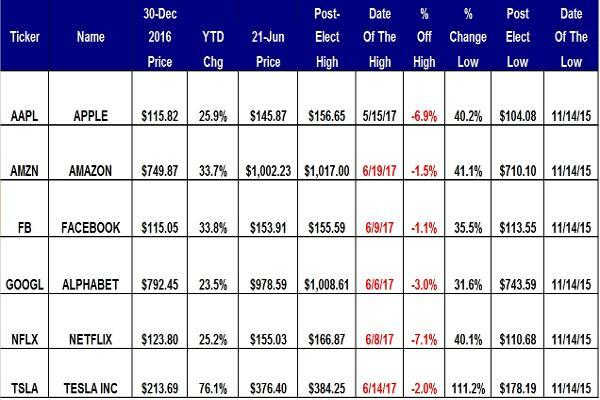 Apple (AAPL - Get Report) , Amazon (AMZN - Get Report) , Facebook (FB - Get Report) , Alphabet (GOOGL - Get Report) , Netflix (NFLX - Get Report) and Tesla (TSLA - Get Report) need to maintain their momentum, or the second half of 2017 will begin with a correction. Here are some warning signs! Apple set its all-time intraday high on May 15, and then fell below my annual pivot of $151.69 on June 9 and now has a negative weekly chart. Amazon has been trading around $1,000 per share since May 30, and after dipping to $927.00 on June 9, set its all-time intraday high of $1,017.00 on June 19. My target by the end of June remains $1,025.99. 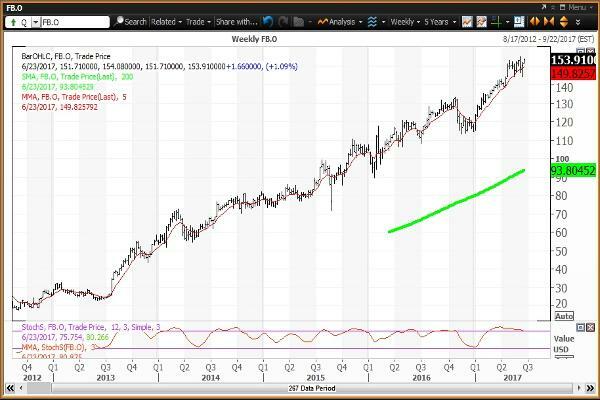 Facebook set its all-time high of $155.59 on June 9, and the near-term upside is to $157.54. Without additional strength, the stock could have declining momentum as June ends. Alphabet set its all-time high of $1,008.61 on June 6, and then held my quarterly pivot of $937.51. The stock can return to the $1,000 threshold, but without additional strength could have declining momentum as June ends. Netflix set its all-time high of $166.87 on June 8, and has near-term upside to $167.84, but that's an unlikely outcome. Without additional strength, the stock could end this week with a negative weekly chart. Tesla continues the lead the momentum race of 2017 by a wide margin. The stock is up 111.2% since trading to a post-election low of $178.19 on Nov. 14. The stock set its all-time high of $384.25 on June 14, which was a test of my semiannual risky level of $381.28, where investors reduced holdings. 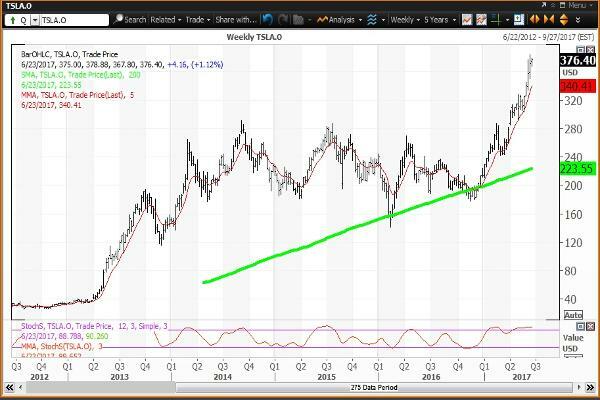 Tesla still has a positive but overbought weekly chart. Meanwhile, Jim Cramer isn't buying Apple here, and says Facebook and Alphabet look better on a dip. Apple's shares fell 0.2% to $145.63 by Thursday's close. Apple, Facebook and Alphabet are holdings in Jim Cramer's Action Alerts PLUS Charitable Trust Portfolio. Want to be alerted before Cramer buys or sells AAPL, FB and GOOGL? Learn more now. All six mojo stocks set their post-election lows on Nov. 14. Strength since then has been based upon stock-specific news including reactions to earnings reports. The first to peak was Apple on May 15, but this name is in bull market territory 40.2% above its low. The latest to peak is Amazon on June 19 with this stock 41.1% above its Nov. 14 low. The weekly chart shows the 200-week simple moving average (in green), which is also considered the "reversion to the mean." A stock trading below its 200-week will eventually rise to it. A stock trading above its 200-week will eventually decline to it. The weekly chart also shows the five-week modified moving average (in red) and a momentum study. I advocate the 12x3x3 weekly slow stochastic reading, which scales from 00.00 to 100.00. A reading above 80.00 is overbought and a reading below 20.00 is oversold. 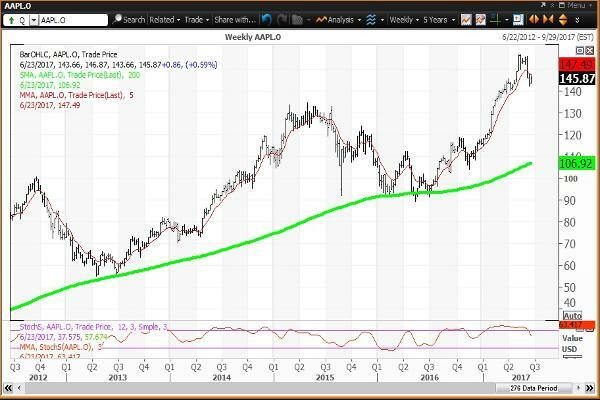 The weekly chart for Apple is negative with the stock below its five-week modified moving average of $147.49. The 200-week simple moving average or the "reversion to the mean" is $106.92. The 12x3x3 weekly slow stochastic reading is projected to decline to 63.42 this week down from 76.34 on June 16. Current Strategy: The downside risk is to the 200-week simple moving average of $106.92 as my annual pivot of $151.69 acts as a magnet for the remainder of 2017. 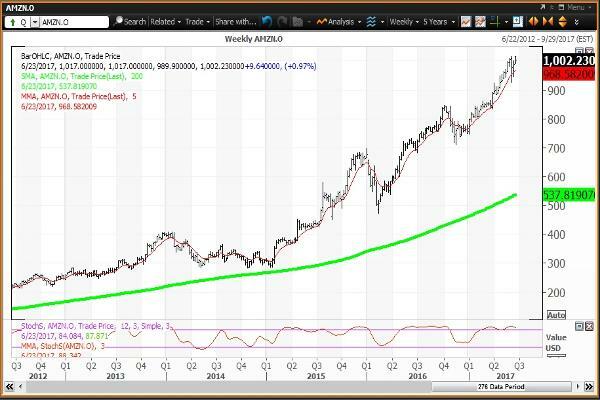 The weekly chart for Amazon remains positive but overbought with the stock above its five-week modified moving average of $968.58. The 200-week simple moving average or the "reversion to the mean" is $537.82. The 12x3x3 weekly slow stochastic reading is projected to slip to 88.34 this week down from 90.47 on June 16, well above the overbought threshold of 80.00. Current Strategy: Sell strength to my quarterly risky level of $1,025.99 if it occurs by the end of June. Buy weakness to my annual value level of $753.89. The stock has been above this level since Jan. 5. 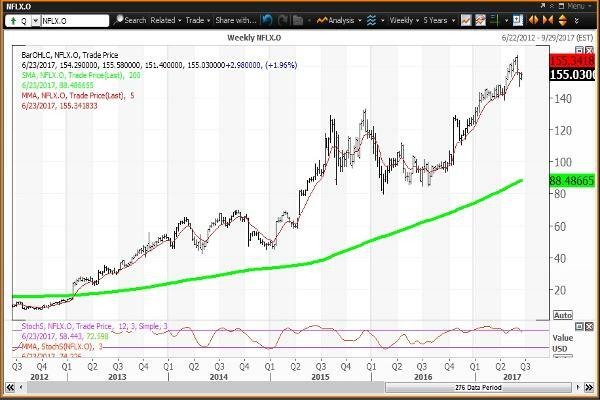 The weekly chart for Facebook remains positive but overbought with the stock above its five-week modified moving average of $149.83. The 200-week simple moving average or the "reversion to the mean" is $93.80. The 12x3x3 weekly slow stochastic reading is projected to slip to 80.88 this week down from 83.44 on June 16. It is feasible that this reading will end June below the overbought threshold of 80.00. Current Strategy: Sell strength to my weekly risky level of $157.34 if it occurs by the end of June. 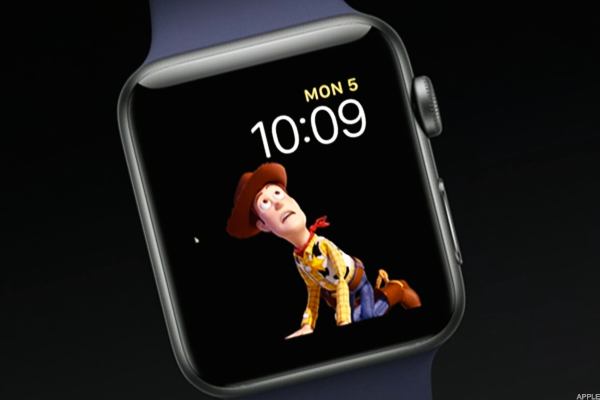 Buy weakness to my annual value level of $109.79. The stock has been above this level all year. 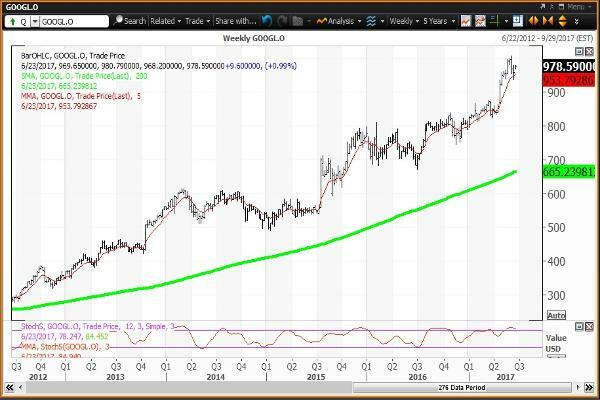 The weekly chart for Alphabet remains positive but overbought with the stock above its five-week modified moving average of $953.79. The 200-week simple moving average or the "reversion to the mean" is $665.24. The 12x3x3 weekly slow stochastic reading is projected to slip to 84.94 this week down from 88.29 on June 16. It is feasible that this reading will end June below the overbought threshold of 80.00. Current Strategy: Sell strength to my weekly risky level of $1,065.79 if it occurs by the end of June. Buy weakness to my annual value level of $899.21. The stock has been above this level all year. The weekly chart for Netflix will be downgraded to negative if the stock ends the week below its five-week modified moving average of $155.34. The 200-week simple moving average or the "reversion to the mean" is $88.49. The 12x3x3 weekly slow stochastic reading is projected to decline to 74.23 this week down from 82.12 on June 16, falling below the overbought threshold of 80.00. Current Strategy: Sell strength to my quarterly risky level of $167.84 if it occurs by the end of June. Buy weakness to my annual value level of $111.17. The stock has been above this level all year. The weekly chart for Tesla remains positive but overbought with the stock above its five-week modified moving average of $340.41. The 200-week simple moving average or the "reversion to the mean" is $223.55. The 12x3x3 weekly slow stochastic reading is projected to slip to 89.65 this week down from 90.08 on June 16, still well above the overbought threshold of 80.00. Current Strategy: Sell strength to my semiannual risky level of $381.28, which has already been doable. Buy weakness to my annual value level of $250.95. This level was last tested as a buying opportunity on March 21.